Organize your slanted or level gondola shelving with Freestanding Gondola Dividers, Shelf Fencing and Binning, Wire Shelf Dividers and Multi-Purpose Dividers. A variety of lengths, heights and foot styles are available to fit your shelves. 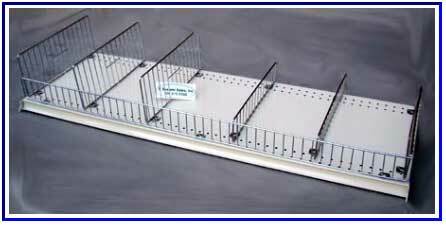 The wire fence and dividers are very durable and will outlast the products you are selling. 3" high front wire fencing, use to organize and separate merchandise while maximizing shelf space. Use our free standing fencing and free standing dividers with two foot styles to accommodate round or diamond-cut holes. Available in chrome or almond epoxy. Free standing wire fencing and wire dividers fit Lozier, Madix and Streater upright shelving depending on foot style and location. Specify fixture type when ordering. Use with 3" high dividers. Use the 6" high front fencing to organize and separate merchandise while maximizing shelf space. Use our free standing fencing and free standing dividers with two foot styles to accommodate round or diamond-cut holes. Available in chrome or almond epoxy. Freestanding wire fencing and wire dividers fit Lozier, Madix and Streater upright shelving depending on foot style and location. Specify fixture type when ordering. Use our 6" wire dividers to make make more compartments.